In the 2010 midterm elections, Tea Party candidates were a key force in helping the Republican Party capture a majority in the House, although the defeats of some Senate candidates favored by the movement may have hurt GOP chances to take control in that chamber as well. Currently, 42% of Republicans and Republican-leaning registered voters say they agree with the Tea Party movement, according to a survey conducted last month. 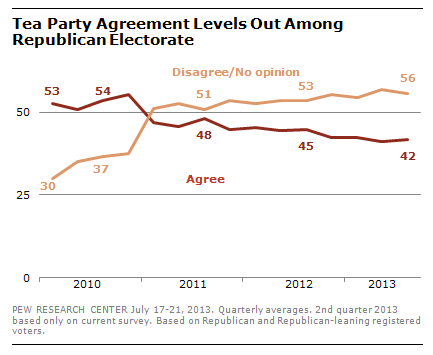 This is little changed over the course of the last year, but down from the height of the movement in 2010 when, in the three months immediately preceding the election, 54% of Republican voters identified with the Tea Party. Although 56% of GOP voters do not express support for the Tea Party, this number consists mostly of those who do not have an opinion; only 11% actively disagree with the movement, the remaining 44% say they have no opinion. The segment of the Republican electorate that is affiliated with the Tea Party differs substantially from other Republican voters, both demographically and ideologically. Overall, Republican voters are evenly divided by gender. Six-in-ten Tea Party Republicans, by contrast, are male. Those who agree with the Tea Party are also considerably older (67% are 50 or older, compared with just 52% of other Republicans). A third (33%) of Tea Party Republicans have at least a college degree, compared with 23% of other Republicans. Similarly, Tea Party Republicans are more affluent than others affiliated with the GOP. White evangelicals—who are 31% of all Republican voters—are 36% of those affiliated with the Tea Party.